Our years of experience have taught us that thermoforming is both art and science ... a fact we readily embrace. Large sizes ... small sizes ... high volumes ... low volumes? No problem. Our 12 thermoforming machines plus inline and offline die cutting flexibility enable us to meet small, medium and large size formats and production volumes with ease. This versatility sets us apart from other thermoforming manufacturers. As your needs grow, we can accomodate you and meet your growing production volumes. Our high-speed Sencorp 2500 thermoformers are equipped with inline die cutting and easily handle large sizes and high volumes. Looking for added economies? Our combination blister runs in multiples of 7,500 could be the solution. By combining your blisters with several other customers, tool and set up charges are shared providing you with a substantial cost savings. Our stock clamshell program enables customers to purchase one or more cases of our full range of stock sizes with no tooling charges and immediate shipping availability. 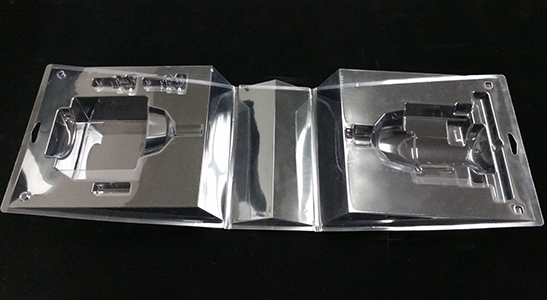 Star Plastic's custom design services produce packaging engineered to meet any requirement. Other capabilities offered include deep draw up to eight inches, flocked material options, styrene or HIPS cosmetic display trays and material gauges from 7 to 70 mil. We also manufacture steel-ruled dies for the printing and packaging industries, and our edge fold (slide blister) machine delivers additional automated capabilities. Ready to get to work? Get in touch with us here.